The global POP display market currently features a fragmented vendor landscape, says a report by Transparency Market Research (TMR). However, the market is close to consolidation as players vie for mergers and acquisitions, along with the focus of international players on vertical integration to expand their outreach. A case in point is International Paper Company. In May 2016, the company acquired Weyerhaeuser’s pulp business thus adding five pulp mills to its production facilities. Such initiatives are anticipated to be growth strategy of several players in the market, adds the report. The key players in the global market for POP display include Smurfit Kappa Group plc, DS Smith Plc, International Paper Company, and Georgia Pacific LLC. The global POP display market was worth US$9.87 bn in 2016. As per estimates of the TMR report, the global POP display market will clock a CAGR of 5.6% during the forecast period between 2017 and 2025, for the market to become worth US$16 bn by the end of 2025. Among the key product segments, the floor display product segment is poised to lead the market at a CAGR of 6.3% during the forecast period. Geography-wise, Asia Pacific is poised to surpass other key regions expanding at a CAGR of 6.5% over the 2017-2025 forecast period. The global POP display market has been witnessing robust growth over the past couple of years as manufacturers are looking for ways of visually appealing merchandising. Thus, enhancing brand visibility, better eyeing shelf space, and effective space utilization are the key elements fuelling the market’s growth. To further improve visual merchandising, manufacturers are considering investments to introduce innovative product design such as rotating die-cut POP display with improved graphics. Further, players in the market are also striving to offer customization as per the branding need of end users. This product differentiation strategy is likely to favor the growth of the global POP display market to a high degree. 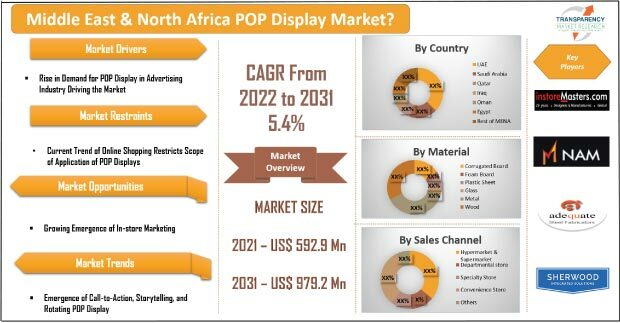 Changing lifestyle and rising disposable income of the urban population have also emerged as key factors driving the POP display market. Individuals in urban areas are spending liberally on packaged food and beverages that has upped the demand for POP displays for retail sales. Today, POP displays have become de facto for branding and packaging of food and beverages. Several FMCG brands are focusing on improving their brand visibility through POP displays in the retail sector. Thus, factors such as growth of the FMCG industry, retail industry, and food and beverages sector are contributing to the revenue earnings of the global POP display market. While steady growth of a number of end-use industries creates a positive outlook for the market, it faces several growth challenges as well. The rising trend of online shopping for all type of consumer goods is posing a huge threat to this market. As consumers indulge into shopping from the convenience of their homes, along with benefits of good discounts and multiple modes of payment, the growth of the POP display market will be affected. Despite several growth challenges, the growth of the retail sector and mushrooming of mom and pop stores in emerging economies is likely to benefit the POP display market in these regions.